Categories: Animals · Creativity · Inspiration Tags: George Kramer · Tucker Heart Valve · Atlantic Coast Vets · Cavalier King Charles Spaniel · Mvd In Cavalier King Charles Spaniels · Mitral Valve Disease In Dogs · Bad Breeders · Dna Heart Tests In Dogs. "As the mitral valve degenerates, the valve no longer fully closes after each pumping action, allowing some blood to flow backwards through them from the ventricle back into the atrium. As the condition worsens, more and more blood is able to backflow through the valve. In the final stages, the valve’s struts sometimes break, causing the valve to collapse completely"
Recently, George Kramer, a veterinary Cardiologist, from,ATLANTIC COAST VETS has developed a device, which effectively 'shuts off' the leaky valve, with a far less invasive surgical procedure. Kramer, and his surgical team sought funding via Indiegogo, for the first stage and are now seeking funding, to carry on with clinical trials. Having mentioned the 'science bit' its important to mention, the emotional devastation that is faced with this heartbreaking disease. This disease almost always leads to congestive heart failure, medications, can help, but they can only slow down the effects, eventually they will fail to help, and the dog will die. There is no definite timing of when this will happen. For some, medication will help for long periods, for others, very short periods. 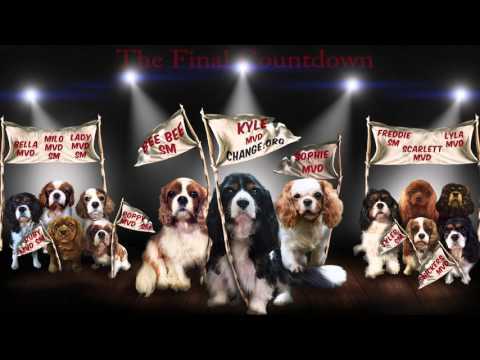 I chose to write this article because i have a personal interest in a cure as one week ago today, Jack, my beloved Cavalier King Charles Spaniel, died suddenly, of an MVD related disease. He was diagnosed only 3 weeks before. It was only one day after the first anniversary of the death of our Popeye, also a Cavalier King Charles Spaniel, who also died of MVD. During Popeye's last few weeks, his meds were failing. The only way that he could rest comfortably, was if I sat up and held him upright. He was my partners best friend,and was utterly devoted to him. So much so, that he used all of his last bit of strength to raise his head and look into his eyes, as he drew his last breath. Popeye and Jacks mother Aries, also has this, yet outlived both her sons. Its sadly just a timebomb, waiting to explode. Shortly before Popeye's death, the story that a UK Cardiologist, performed a risky operation on a Cavalier King Charles Spaniel,was in the news. It was the first of its kind as they were previously only undertaken in the USA. A week before Jack died, I logged into my Twitter account and read the trending news about the Tucker Heart Valve. I hope and pray, that this research is highly successful, putting an end to the heartbreak, and helping Cavalier King Charles Spaniels and other breeds affected by this. Sadly, Aries has now died from this disease (03/02/2016) Her valve suddenly collapsed after the medications, were no longer able to help. This is the last picture of jack, taken at 8.22pm UK time. He had a stage 4 heart murmur, with the onset of MVD. He was treated with medication, but developed sudden bleeding from his bottom just under 3 weeks after starting medication. He was given two injections and, as he wasn't dehydrated, he was allowed home. The vet advised it may be an infection and to monitor him for 24 hours. However he warned that there was a strong possibility that his kidneys were failing, and told us to bring him back first thing in the morning.The treatment for this in dogs would compromise his lungs and would not be compatible with his heart medications.This was a catch 22 situation. Jack, died a few hours later, peacefully in his sleep. The day before, he had refused to eat, but was otherwise fine. He often did this, so there was no apparent cause for concern. Had the Tucker heart valve been available, maybe he would not have had to have his medications. The black and tan colored Cavalier, is Aries, with her son Popeye, who died of MVD on Jan 2 2015. Aries has a stage 5 heart murmur, with MVD, and is currently coping well with her medications physically. However, she has not coped emotionally with the grief of losing her two sons. She has been looking for them. Grief is hard on humans, but also hard on animals too. Sadly, its not mandatory to health test the parents of this beautiful breed, so unscrupulous breeders, reluctant to pay a few extra pounds/dollars to ensure that puppies are clear of this, and another serious life threatening disease, Syringomyelia. Chicago Woman Scatters Ashes Of Fur Baby- Miraculous Ghost Like Image Appears!